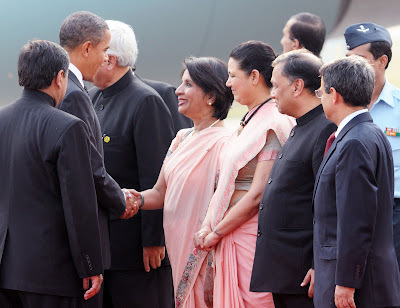 babus of india: Namaste Obama: Did foreign secretary Rao and Ambassador Shankar pre-decide to wear pink saris? Namaste Obama: Did foreign secretary Rao and Ambassador Shankar pre-decide to wear pink saris? AS US president Barack Obama landed in Delhi airport on Sunday afternoon, two senior women diplomats in pink saris were among very few people alongside Prime Minister of India Manmohan Singh and his wife waiting to welcome the arguably the most powerful man in earth and his better half Michelle Obama. 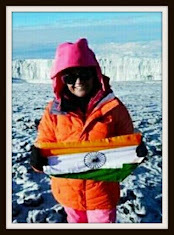 As the television cameras flashed the two ladies in pink saris, many viewers were forced to guess that foreign secretary Nirupama Rao and her batch-mate Meera Shankar, India’s ambassador to US, had probably pre-decided what to wear before reaching the airport to welcome Obama and his wife. Or are they believers of pink as auspicious colours before big occasions? No wonder, in famous Bharti-Zain deal, both telecom honchos Sunil Bharti Mittal and Sheikh Nasser Al Kharafi, made it a point to wear the same Moreschi shoes whenever they met as they turned superstitious and believed that the deal would go through if both of them wore the same shoes every time they met. And yes, whopping USD 10.7 billion mega telecom deal was finally struck! Rao and Shankar, both 1973 batch IFS officers, have been working overtime during the last few weeks to make this high-profile visit of US president a mega success. Both have acted as trouble-shooters and aired significant comments in the run-up to the visit. A few days before Obama reached Mumbai, Ambassador Shankar, for example, had talked about how India needs to watch the anti-outsourcing sentiment in “new political scenario” in the US. Foreign secretary Rao, on her part, stressed how the victory of Republicans would not impact the India-US relationship, which enjoys “bipartisan support” in that country. After shaking hands with foreign secretary Rao in Delhi airport on Sunday (see picture), US president patted the next woman in pink sari, Ambassador Shankar, who in turn exchanged a few words with Obama. The President, who does not know many Indian ministers and officials welcoming him, was seen visibly pleased to find a known face, Ambassador Shankar. Ambassador’s husband and former industry secretary Ajay Shankar (second from right in top photo) was also present in the airport to welcome the US first couple. Shankar, a 1973 batch IAS, has been staying in US after he had retired 10 months ago.